Today was a travel day from Osaka to Fukuoka (or Hakata, as it is also called). I had considered using the morning to visit the Umeda Sky Building in Osaka, but wasn't sure about the timing of the trains so decided to just get to Shin Osaka to catch the Shinkansen. It's a good thing, too, since by the time I got to buy my ticket I only had 4 minutes left to catch the train! I ran to the platform, lugging my bags all the way, only to discover there was no escalator. After brief consideration, I hauled the bags up the stairs myself and dashed onto the train just as the doors were about the shut. Well, at least I got my workout for the day in. By the time I got to my hotel in Fukuoka, it was already 2 pm, so I thought I'd head out for a walk and find a yatai for Hakata ramen, the local specialty. I ended up checking out a bunch of temples and shrines in the vicinity first, and then found a small fast food ramen stand. Although delicious, I was a bit miffed that there was only one piece of pork, and it was small at that! But for 290 yen, I guess beggars can't be choosers. America-ya, a clothing shop across from the ramen stand. 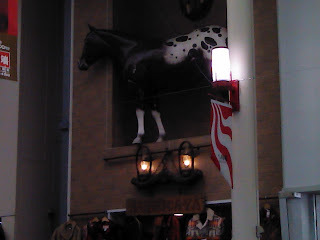 I thought the horse was a nice touch. Rough Guide mentioned that nearby the shrines there was a covered arcade shopping strip with a shop selling zenzai, which is a hot soup made with red beans and mochi (incidentally Rough Guide, you are wrong! It's only 450 yen, not 600). 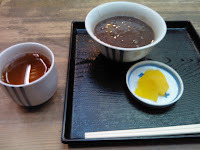 They serve it with ocha (tea) and daikon (pickled radish), which tempers the sweetness of the soup and provides a nice contrast. This is quite a lovely thing to have on a cold day (although in all honesty I didn't need my coat today, it's that warm). 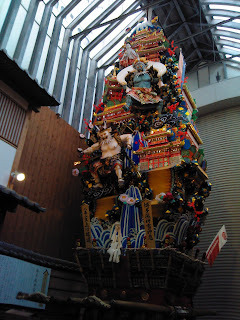 You can find the zenzai shop because it is the only one that contains a giant festival float. After this I had a break back at the hotel, then decided to have a late dinner. I didn't feel like much because of all that food in the afternoon, but thought I'd take a look and see what was out there anyway. The guide book said that the nearby Canal City had lots of good places to eat, but when I looked it just didn't seem appealing. It was mostly Hakata ramen, which I had had for lunch, or tonkatsu and other fried foods, which seemed too heavy. However, across the street was a little sushi place, and a few pieces of raw fish seemed like it would hit the spot. Although the outside menu didn't have pictures or English (even the prices were in kanji, which I can guess at but don't know very well), I decided to go for it. When I entered I could tell there was some trepidation from the staff. They did have an English menu after all, but it clearly didn't match the Japanese one, and anyway I know enough about sushi to tell what I like. I ended up getting a set of eight pieces (Jou), including the very best uni I've ever had - really creamy and sweet. Already feeling very conspicuous, I didn't take a pic, but this is the set from their website. Oishii!!! Meanwhile, there was a very drunk salaryman a few seats away who made sure the staff knew I was ready to order, and he and the sushi chef chatted a bit (evidently about me, I could tell from the pointing). The sushi chef told me I was bijin and that he and the salaryman thought I had a nice face (this could be creepy, but they were just joking around and were very friendly). Then a large bowl of miso filled with clams arrived for me, as a sabisu1 from the salaryman (he asked if I wanted to finish off the giant bottle of sake/shochu he had in front of him too, the largest bottle I have ever seen, perhaps nearly two feet tall, but I politely declined). The salaryman had to leave but I had a nice chat with the sushi chef and his assistant - they were really nice people and although it was a little weird to be bought miso soup, at least it helped break the ice! The restaurant is called Ganeya and is in the Tenjin district, very close to Gion station. I highly recommend it; if I go back I will try something from their live menu. It wasn't even that expensive for sushi in Japan (which can easily become extremely pricey very fast). Lesson learned: sometimes the guide book has good advice, but there sure is a lot missing. Besides which, I've never had a bad meal in Japan, and I think finding an 'off the beaten track' restaurant will often be as good or better than the more touristy places provided in the books. 1. Sabisu is an English loan word, service, which in Japanese is used to mean a gift or free item. I couldn't find a reference online but I used to get sabisu at the noodle shop I went to about once a week, I usually got a discount or a free bowl of noodles. I also got sabisu tickets when I went to the dry cleaners; once you had enough tickets you could get an item cleaned for free.